Terming it as a "virtual consolidation" in the highly-competitive telecom space, Anil Ambani on 30 September said his group firm RCom is tying up 'trading and sharing' of spectrum with Mukesh Ambani-led Reliance Jio including for the much-awaited 4G services. Addressing shareholders at the Annual General Meeting, Reliance Communications Chairman also said he was "grateful" to his elder brother for "unstinted support and guidance". The two brothers have begun collaborating with each other in certain businesses over the past few years, after a long period of cut-throat rivalry following a much-publicised split of 2005 of the erstwhile Reliance empire founded by their father late Dhirubhai Ambani. "This strategic cooperation and partnership between RJIO and RCom is a virtual consolidation in the telecom sector and I'm grateful to my elder brother Mukesh bhai for unstinted support and guidance," Anil Ambani said. He added that both the companies are at "an advance stage of discussion" for finalising a nationwide trading and sharing arrangement, which will be followed up with reciprocal arrangements between Reliance Jio and Reliance Communications for letting customers roam on each others' networks. "I believe this will be a true gamechanger for the sector and we will see benefits in coming years," he said, adding that they will be able to jointly offer "gold standard" services. This will facilitate RCom customers to access RJio's 4G network on an "asset light" and "minimum capital expenditure" model, he said. RJIO will also substantially benefit from access to RCom's entire portfolio of 800-850 MhZ spectrum in all circles to supplement it is holding, he added. Anil Ambani added that their father Dhirubhai, whose death resulted in the two brothers splitting businesses and the younger one getting the telecom business, would have been very happy for such a partnership. It can be noted that in 2010, both the brothers ended a non-competitive pact, which paved the way for Mukesh to enter the telecom space. Immediately afterwards, Mukesh Ambani's company bought over a company, which had bagged a pan-India 4G spectrum. The company, RJio, is slated to roll out its business soon. Welcoming the government's move to come out with guidelines on sharing of spectrum and trading which is expected soon, Anil Ambani said, at present, Rcom's partnership with RJio includes sharing of towers, optic fibre and ducts among others. The partnership was signed in 2013, he said. 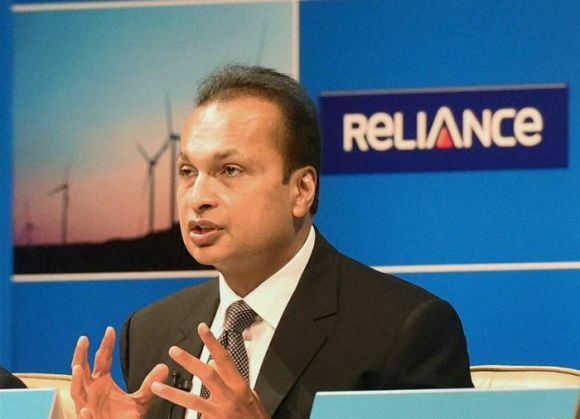 Meanwhile, on the sale of its 95 per cent stake in the tower company Reliance Infratel, Anil Ambani said there is "excellent progress" in a strategic process to create an independent tower company. "We expect to sign and announce this new independent tower company formation and transaction by end of this year," he said. Apart from this, the company is also in talks to sell some of its realty assets, he said. The transactions will help reduce RCom's overall debt and strengthen the balance sheet, he said. Stating that there is a need to reduce the number of operators in the telco space, Ambani said RCom's discussions to merge SSTL/MTS Indian operations through a stock swap are at an advance stage. "We are expecting to finalise this and announce this in the course of next few weeks," he said, adding that the merger will help it in eight circles and add to spectrum it holds. READ NEXT >> Google Nexus vs Apple iPhone: what's with the weird trend of buying the more expensive phone?